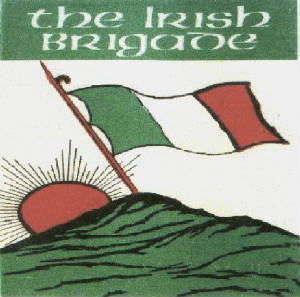 The Irish Brigade Song Lyrics And Guitar Chords. The Irish Brigade started out playing rebel songs in the early eighties and are still going strong today. They write most of their songs themselves but also cover most of the older rebel songs that were big hits for the Clancy Brothers and The Wolfe Tones in previous years. The group come from Co. Tyrone and have recorded at least ten albums. Songs are an important part of a people's resistance to oppression. In times of despair songs or war tunes life our spirits. songs commemorate fallen heroes or retell notable events. Rebel songs show that we cannot and will not be beaten. Of course ballads on their own cannot defeat any enemy, or can they. In the H-Blocks of Long Kesh or in the dungeons of Armagh Women's prison songs became a weapon in the prisoner's arsenal. Ballads showed their defiance and broke the spirits of their captors. The songs were sung in Irish, sung without accompaniment ''Sean Nos'' style, tunes echoing along quiet corridors, from behind cell doors rising in solidarity. Prisoners sang political songs, old rebel tunes and new ballads.